This used to work and I have no idea why it now blinds all reads of the CreditCardInfoCreditCardNumber field in the Customer table. I had used QODBC previously to transfer an entire QB 2006 Canadian company into a new QB USA 2008 file. 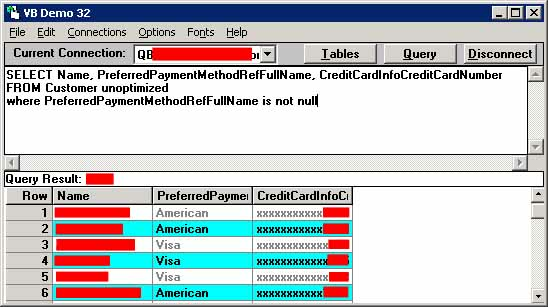 At that time, I had no problem reading the actual credit card number from an MS Access application using an ADO connection. Now when trying to read from the QB USA 2008 company I either get NULLS in this field or the information is blended with the Asterix characters as in the subject above (the same thing happens using the supplied VB Demo application). This depends on what optimizer flags I am using (VERIFY, NOOPTIMIZE, etc.) I haven't found a combination yet that gets me the whole credit card number. Before you ask why I need this it's because we do our own credit card billing through the Authorize.net gateway and I don't want to have to maintain a separate store of CC information for security reasons. Sorry, but Intuit no longer allows the full credit card number to be seen using QuickBooks 2008 USA Edition and the qbXML SDK v7.0. The API is changing the Credit Card to "xxxxxxxxxxxx1234", not QODBC.